A few months ago, a friend of a friend mentioned they had tried the beer from Blue Hills Brewery at a local beer fest and it was the best beer there. Now, I don't know this person, or what their beer IQ is, but I have been intrigued by this company ever since. The brewery is brand new so they do not have set tours or anything; but last Saturday they sent me an email inviting me to a tasting at their brewery. I was lucky enough to show up as the brewmaster was giving a tour and tagged along to the end. The brewery wasn't very big, but they definitely made use of all the space available. I started with their IPA, not expecting too much, and I was immediately floored. Now most people I know, especially those in the Boston area, measure their IPAs against Harpoon IPA. Understandable. Harpoon IPA is delicious. The Blue Hill India Pale Ale is right up there with Harpoon. 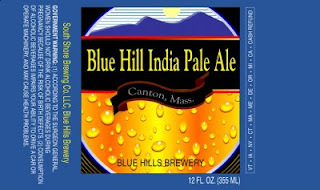 The Blue Hill has slightly less hop bite to it, but it matches up in all other categories and their taste is close to identical. The Blue Hill IPA though comes off a bit smoother, due to the less hoppy bite, but sometimes that's what you are in the mood for. The Blue Hill IPA gets a 4.5. The Blue Hill Xtra Pale Ale was a very smooth pale ale, it doesn't have the bite of a DPA or the weakness of those English Pale Ales. The Xtra Pale Ale is refreshing and has a nice honey citrusy taste. The Xtra Pale Ale gets a 4.0. Unfortunately, for you, Blue Hills Brewery is not offering bottles or cans mass market yet. They are in several local restaurants in the Boston/South Shore Mass area (Doyle's, RedBones, Irish Ale House just to name a few), I'll post the entire list in the comments. But you should definitely go out and look for this beer, it's too good to pass up. Oooh, I'll have to track this down somewhere. Sounds tasty! XPA available at The Village Manor, Dedham. ok, where have you been? i brought you three new beers like a month ago and still no review.. I've got what Phil needs to get him out of the Blog post doldrums: North Coast Brewing Company. I've tried 4 of their offereings and really like the Acme IPA, Red Seal Ale and Blue Star.